Fuel is important for businesses and emergency crews. When there is an emergency you can rely on ELI Roberts & Sons. 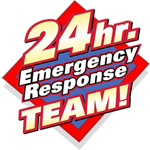 We have a 24 Hour Emergency Response Team that is ready for anything… when Hurricane Katrina hit New Orleans in 2005, we dispatched units to provide fuel for emergency vehicles, police, fire and generators. As a regional petroleum distributor we know that we need to be prepared. Our facilities at 2195 Lake Bradford Road, Tallahassee, FL are Hurricane Ready. In the event of a citywide power outage, we have emergency power to keep emergency vehicles fueled.